“I lost my father two years ago. My mother works in a ration shop. I took up a part-time job at a hospital to support the household needs,” says 14-year-old Renu* studying in Class IX. She lives with her mother and two sisters in a slum in Visakhapatnam, Andhra Pradesh. This was life for Renu till a friend of hers took her to a meeting of an adolescent girls’ group formed with support from Mahila Action, an ally of ActionAid India. The meeting was soon to become a turning point in her life! 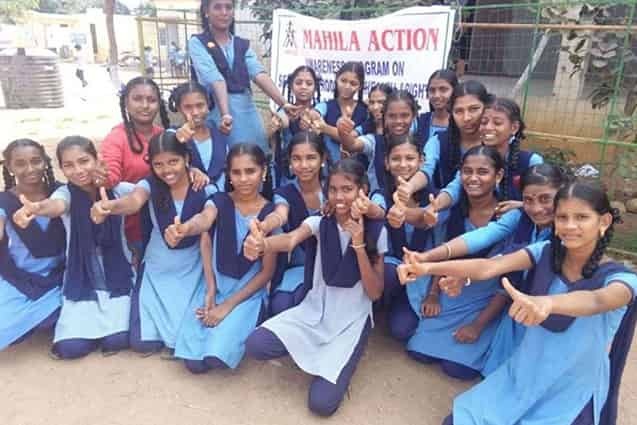 Mahila Action and ActionAid India have facilitated the formation of a total of 12 collectives of adolescent girls across slums in Visakhapatnam. Called Chelimi Groups, after the Telugu word chelimi which means friendship, these collectives provide training for adolescent girls on child rights, sexual and reproductive health and rights (SRHR) and self-defence. Under the leadership of the Chelimi Groups, the youth in these slums are now addressing the issue of child marriage; they are also identifying drop-out children and motivating them to go to school. In addition, young women, who are domestic workers, are being linked with Mission for Elimination of Poverty in Municipal Areas (MEPMA), Andhra Pradesh Government’s nodal agency for urban poverty alleviation, for skill-upgradation programmes like computer basics. “Upon attending Chelimi Group’s meetings, I gained knowledge on the rights of children, the various issues faced by girls and the ways to resolve them. I also quit my job after three months as I got support from the Labour Department for my education.Over a period of time, I became the leader of the group.In the group, we actively discuss issues of child abuse and child marriage,” narrated the young Renu.Through the SRHR programme conducted for the group, Renu learnt about physical and mental growth, good-touch and bad-touch, hygiene and other life-skills. She eventually also got the opportunity to become the SRHR leader in her school. Renu and other young members of this Chelimi Group are now empowered enough to be able to identify and address problems arising in their localities, and to approach concerned authorities for necessary help and action. They have already stopped two child marriages, and are monitoring and ensuring there is no child labour in their area. “Thank you, Mahila Action and ActionAid India, for building my confidence. You enabled me to become a leader and to bring about social change in my community,” saidRenu with a smile on her face and confidence shining bright in her eyes.